Hi friends, today is a day I have waited for a long time to come. 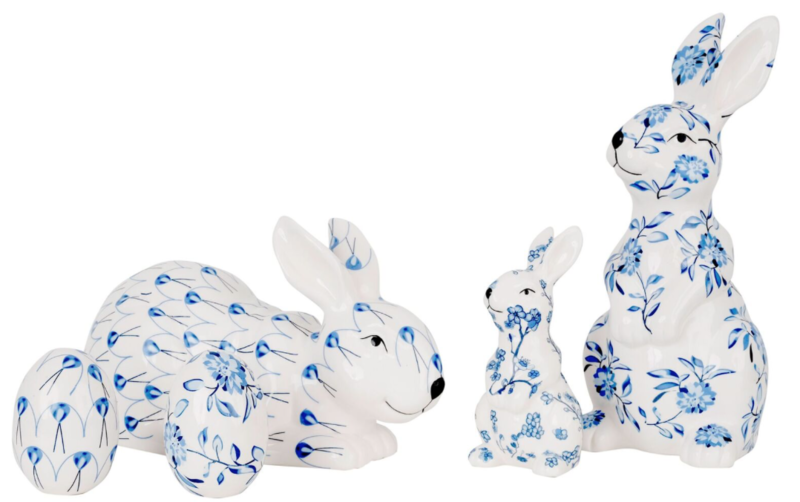 My beloved blue and white bunnies, eggs and the newest collection of the giftwrap all became a beautiful reality and are here! As of today, all of our presale orders have shipped so our arrival sale has officially begun as of this morning. This was a long time in the making but so worth it, it is absolutely beautiful, I made paper I wanted to find, classically beautiful paper that is as unique as it is gorgeous. 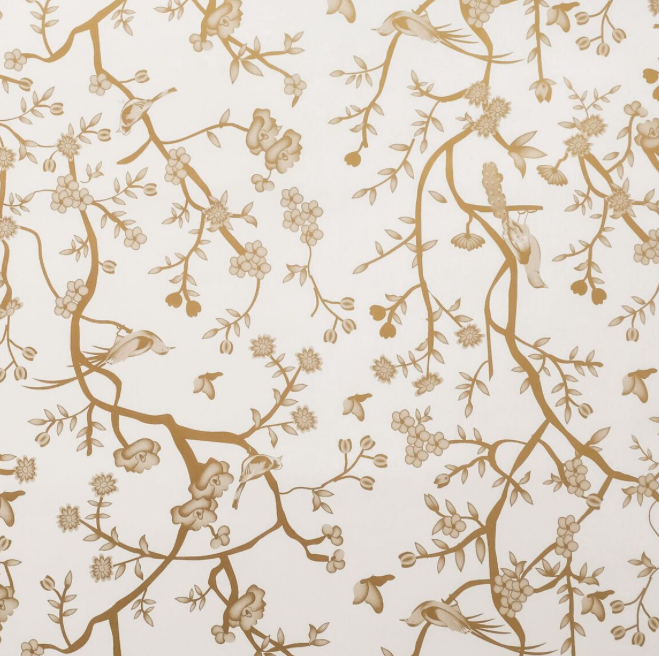 The chinoiserie especially the ivory could double as a beautiful holiday paper. When I couldn’t find it, I created it! ITEM 4. THE REAMS OF PAPER. Sometimes you love a paper so much you want to be sure you have plenty that will last a long time. That is when a ream comes in handy! I know I will be keeping a number of them for myself. Reams measure 204 feet by 30″. All patterns are offered in the ream, remas generally sell for around $300 per ream so these are exceptional deals and an amazing value!! ITEM 5. 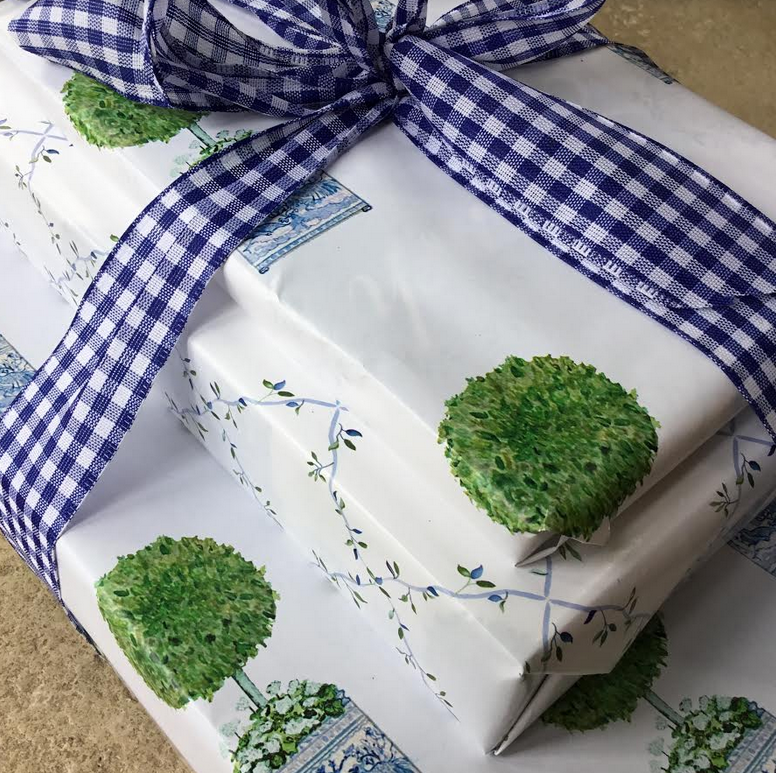 By popular demand, now offering the blue and white gingham ribbon many have asked about, it is a beautiful compliment to both topiary papers. Available with a giftwrap order, this 33 yard roll (1.5″ wide) is $18.00 with the purchase of giftwrap only. Love the eggs as well as the bunnies. My favorite is the dark blue and white trellis egg. The boxwood paper and the lemon topiary paper- LOVE LOVE LOVE! These are gorgeous designs! OMyGoodnes. I want it all. The bunnies are adorable and the paper…Omy! Oh, I love the bunnies! The papa and baby bunnies are my favorite, they are so beautiful. I hope the bunnies will become a permanent item in your store! How can one pick just one favorite item when each and every one is divine? I’m obsessed with your wrapping paper! I love the lemon topiary and the boxwood topiary patterns. And the bunnies are so adorable! Topiary paper and gingham ribbon. Thanks so much! My favorite items are the papa bunny and the white cherry blossom egg. Although the wrapping paper with the pale green and gold is a very close 2nd. I know my Mom will love receiving gifts in that paper so I will definitely be purchasing some! Over the top ecstatic about the lemon topiary paper and the blue gingham ribbon!!! Lemon topiary and box wood paper with blue Gingham ribbons! I so love your design of the papa bunny but your papers are my favorite. The boxwood and lemon topiary (along with the gingham ribbon) would make any recipient feel very special. Hard to pick….but I think the bunnies are adorable and all the gift wrap…love! Baby bunny!!! Lemon topiary paper!!! 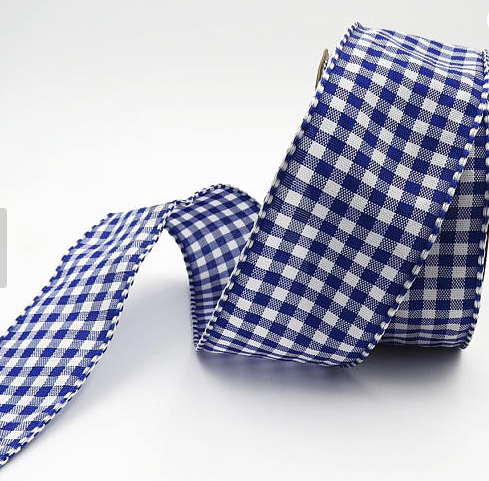 Blue gingham ribbon…oops, I was supposed to stop with two favorites. Love the gold chinoiserie wrapping papers. I would like a mix of all the colors. I can just see them with a beautiful satin ribbon. Love the Bunnies and the eggs. They look so good together. I would use them all yeat. 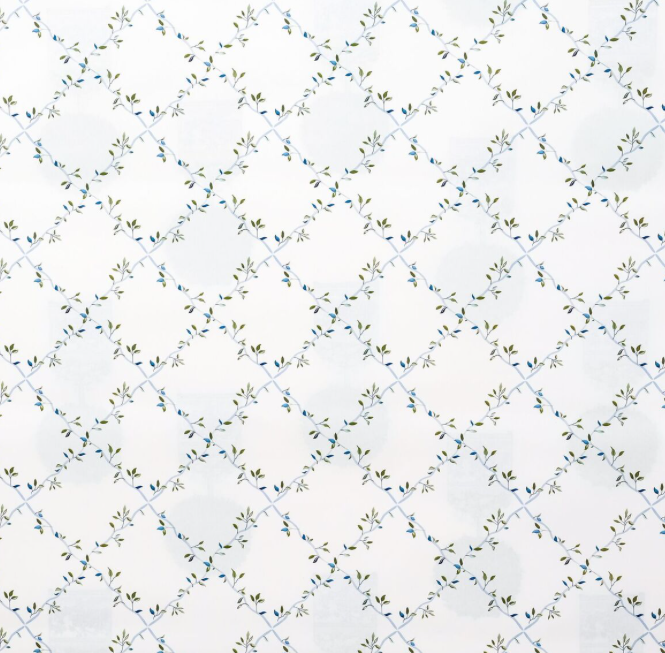 Everything is beautiful, but I must have the pale blue chinoiserie paper. It’s a classic! Gosh it’s all wonderful. I think my favorite 2 are the baby bunny and the boxwood planter/trellis gift wrap. I love the boxwood paper and the bunnies! The eggs are great too!! Love the bunnies because I am a bunny fanatic and the boxwood/trellis paper. Such a sucker for the bunnies and eggs, just the CUTEST! I love every single roll of your gift wrap but especially the boxwoods with trellis! My favorites are the bunnies and those eggs! Too cute! The lemon topiary paper matches my Royal Dalton dishes! How perfect to wrap dinner party gifts. The quality of your papers is the best, this will be my second order. Thanks for coming up with something that is quality and that you can’t get “just anywhere”. Love the bunnies and the lemon topiary paper. Beautiful! The wrapping paper is exquisite as well as the ribbon. Papa and Baby bunny, hands down my favorites because they are so darn cute! I have been looking forward to the arrival of the gift wrap! It’s difficult to find lovely, unique multi-purpose gift wrap. I love the pale pink chinoiserie paper but think the lemon topiary and gingham combo is a fun surprise for housewarming gifts! I love, love, love your wrapping paper and of course the gingham ribbon too! I love the bunnies. All of them. The smiles on their faces make me smile. Don’t you just love when you walk past something in your home that makes you happy! My favorites are the lemon topiary and boxwood topiary papers. They are all so pretty! I really love the bunnies and eggs. They are so adorable and so nicely decorated! Love the boxwood with trellis and ivory chinoiserie! I am just in love with the set of bunnies and the eggs both! They go together perfectly! Thank you for making them available! The cherry blossom eggs are lovely. 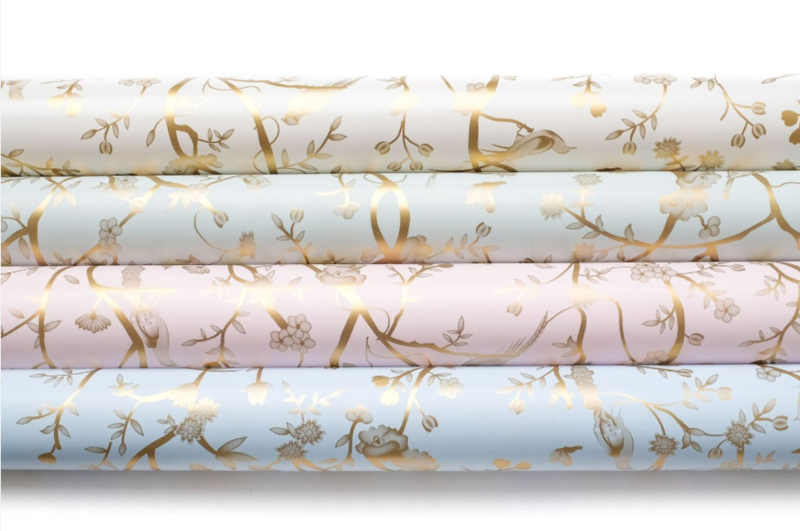 And the chinoiserie gift wrap is amazing! It looks so much like a wallpaper I’d be tempted to put it in my powder room, lol! Hard choice to pick just two, but definitely the blue and white planter with boxwood and the perfect complement of blue and white gingham ribbon. Will definitely order the boxwood and trellis paper and the gingham ribbon. Thanks for the option you provide by making the paper reversible. I wish I could have it all! Love the bunnies and the papers! 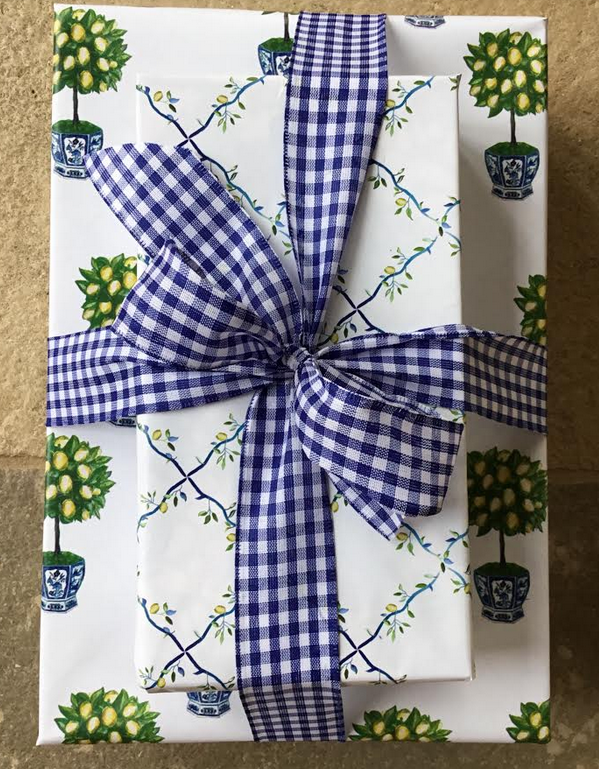 Love the gift wrap, especially the topiary, and the gingham ribbon! I love the Boxwood Trellis and Lemon Topiary papers, and that adorable blue and white gingham ribbon. So fresh and unique! I love how these papers can be used for the holidays or everyday celebrations! I love the adorable bunnies. They are not just Easter but all year round. The mama bunny & the lemon topiary paper! It’s all simply beautiful!! Great job, Tina. It’s a tough choice because I really love it all. But the blue and white eggs and the boxwood with trellis wrapping paper are calling my name! Wrapping paper and ribbon is gorgeous! The bunnies and eggs are so precious. I love all the bunnies and the lemon tree gift wrap! I love that wrapping paper. It is so pretty. 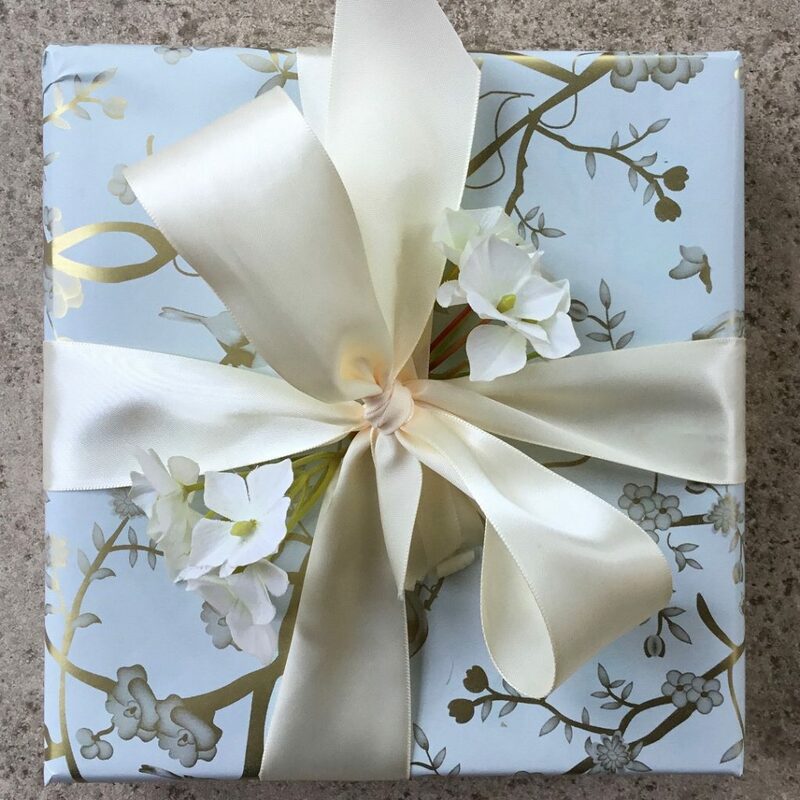 The Bunny family is so beautifu hard to just pick one, the all occasion wrapping paper and ribbon is an elegance to any gift! I love those bunnies and that wrapping paper. I Adore the wrapping paper. It’s just beautiful and the colors are fabulous. Also loving the eggs! I forgot to say I love those eggs. They are lovely. I meant to say I love the bunnies, too. The blue topiary paper is my favorite! Just beautiful! Your papers are fabulous! I live them! The gingham ribbon puts it over the top. I’m in love with the boxwood trellis and the lemon topiary papers! I really love the eggs and the topiary wrapping paper. The bunnies are also very cute. Fun new things. I love the 6×12 inch bunny and the lemon topiary paper with trellis! Love all the paper and the bunnies! The Bunnies and Eggs are my favourite! 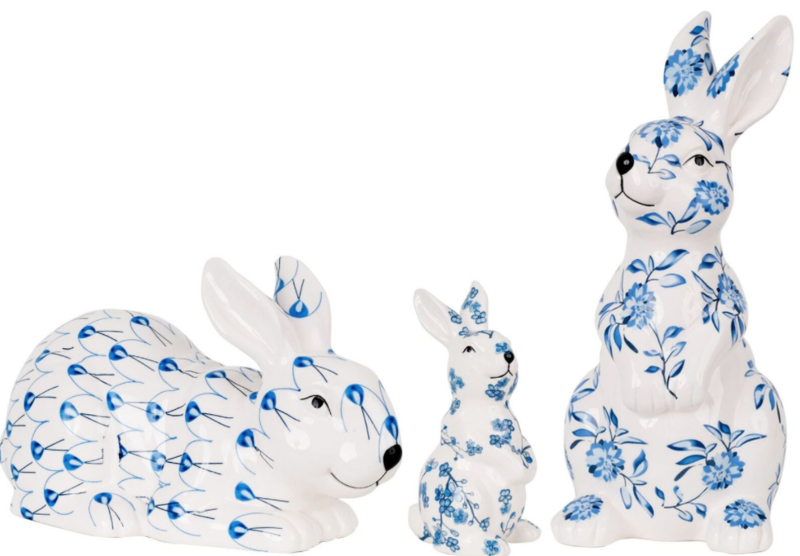 These bunnies would complement any living space year round! I adore the topiary papers! Oh my…all so beautiful!! 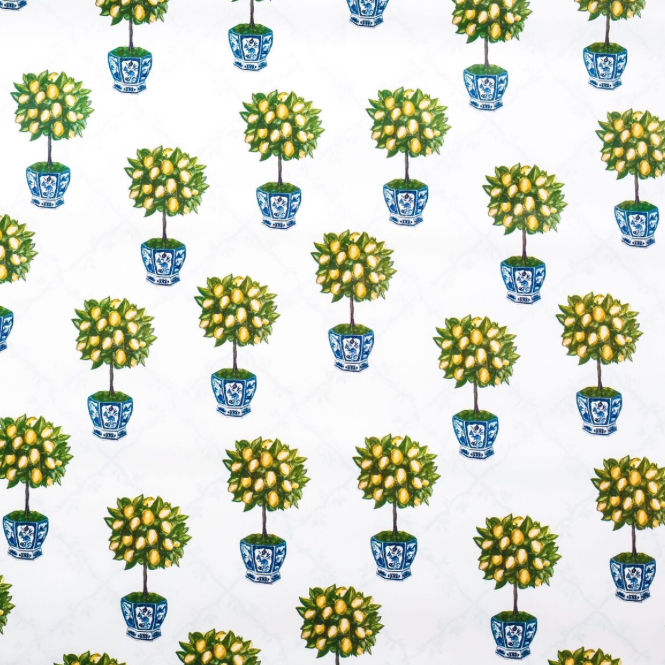 My favorite has to be the lemon topiary wrapping paper…stunning! 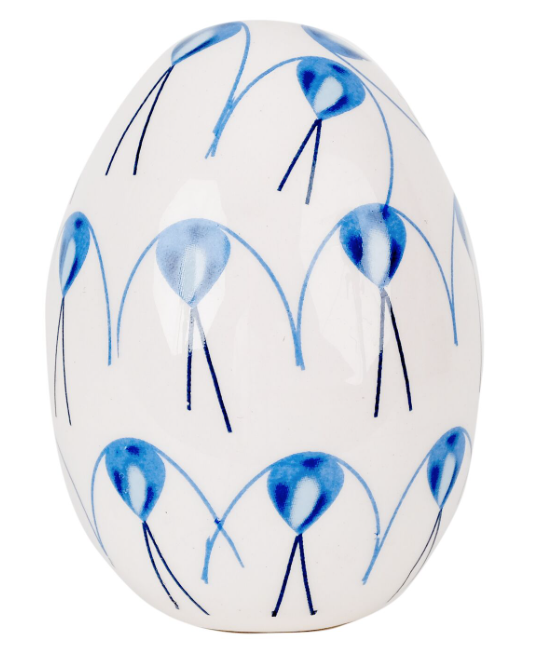 The chinoiserie papers and the adorable eggs are my favorites. Great job Tina! Must say I love it all but the lemon topiary paper with the blue and white gingham bow really stands out. The lemon topiary paper is fabulous! My two favorite items are 1d and 3c. It’s SO hard to choose because they are all so fresh looking, and really pretty! Tina- you are amazing- I wish we could be neighbors, but here in Charleston! Love the bunny family and the blue boxwood topiary paper. Such good taste for décor items and wrapping paper! All very unique and adorable, Tina. The boxwood topiary paper coordinating with the trellis paper makes me happy!! Add the gingham check ribbon and I can’t stop looking at it!! 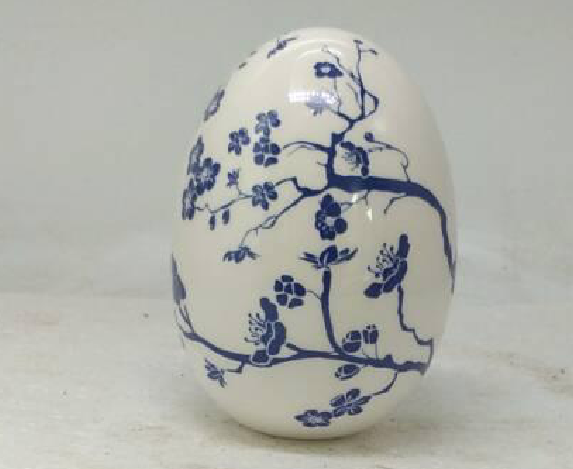 The chinoiserie papers and the painted eggs are wonderful. Actually, everything is a winner! Love all but favorites are 3 piece bunnies and floral egg. I love the big and small bunnies. So cute! 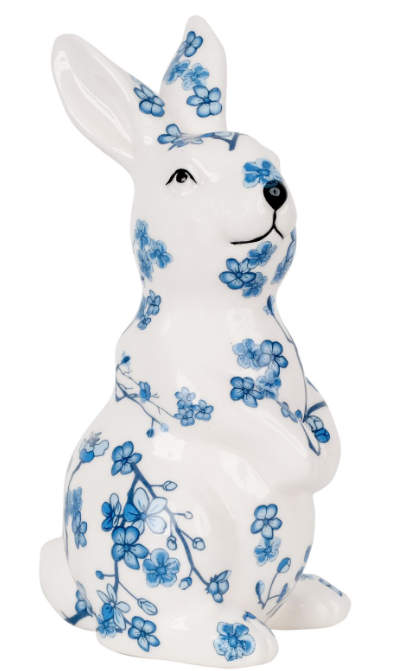 I love the small bunnies and the topiary gift wrap-with the blue gingham ribbon! Would make for a great presentation !!!! Boxwood topiary paper is my favorite with the cream with gold chinoiserie a close 2nd. 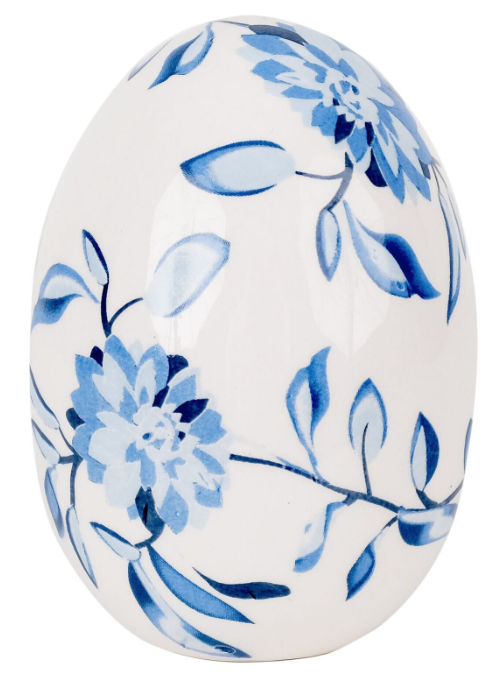 My favorites are the blue and white planter with boxwood wrapping paper and the white cherry blossom egg. Very nice. Love the boxwood topiary and the trellis combination. So pretty! Wow! #1 The chinoiserie papers are gorgeous ( the beautiful satin bows a +) and #2 the reversible trellis and topiary paper is genius! My two favorite items are the bunnies & the gift wrap. Every single item is just out of this world! Love all of them. Simply adore the boxwood trellis and the lemon topiary papers! Makes me smile! Gorgeous! I’m loving the topiary wrapping paper and the eggs! So pretty! Who knew blue gingham could look so elegant? I can’t limit myself to just 2 items! Favorite? How can I choose a favorite? OK. 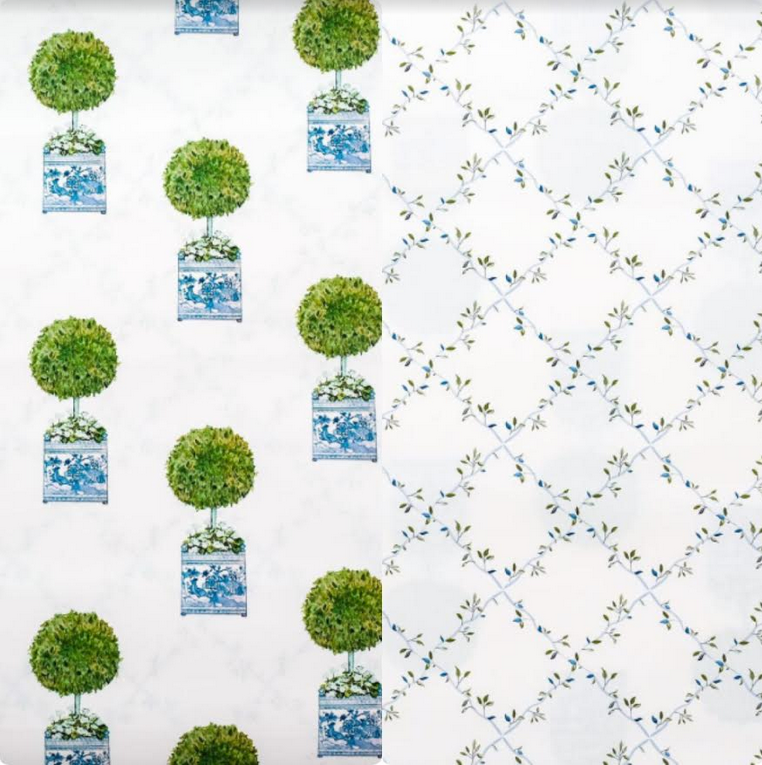 If I must: it has to be the Chinoiserie paper in ivory…so classic and perfect for so many occasions, and the lemon topiary paper…such a surprise and so unique! 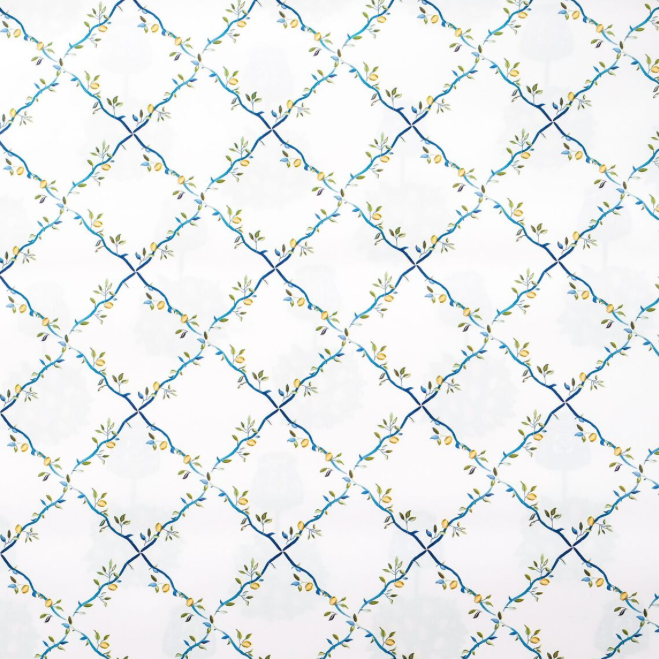 Love the chinoiserie papers and the boxwood trellis paper!!! I love the white/gold and I love the pink/gold. 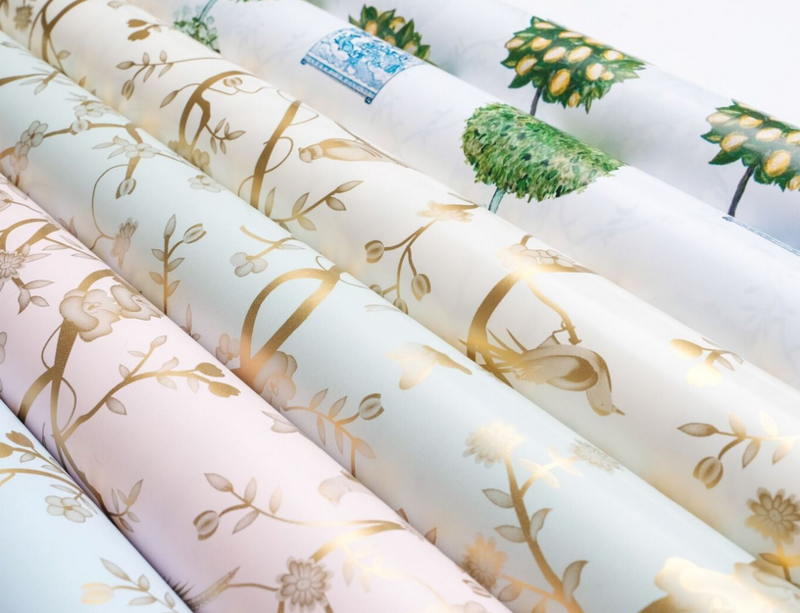 The beauty of the wrapping paper would definitely add to a lovely gift. Love all things topiary and gingham! Delightful paper and ribbon and just my style. LOVE the bunnies and that gingham ribbon!! All of the papers are beautiful! Love the lemon topiary paper! Absolutely love the lemon topiary paper! And the blue gingham ribbon is a perfect touch. I never thought I would “do” a blue and white Christmas, but I am. Which means I did not buy nearly enough wrapping paper. I love your gift wrap! It is gorgeous! Thank you… I guess, I need the ornaments also. lol. This is going to be fun! Christmas in June (who knows what craziness there will be in July? Maybe I’ll only give out gifts that are blue and white!). Anyone would love a gift wrapped in these papers! It’s all about presentation, presentation, presentation! My favorites are the bunny set and the lemon topiary wrapping paper. Great items! The bunnies are divine and so is the gold chinoiserie giftwrap. I love them all! I’m definitely in for a ream as I can see using the paper to line drawers in the butlers pantry as well as simply beautiful gift wrap. Love the bunnies and the lemon gift wrap! Love the topiary papers and love that you can buy large rolls!!! Love it all, but the pink and green papers are my favorites! 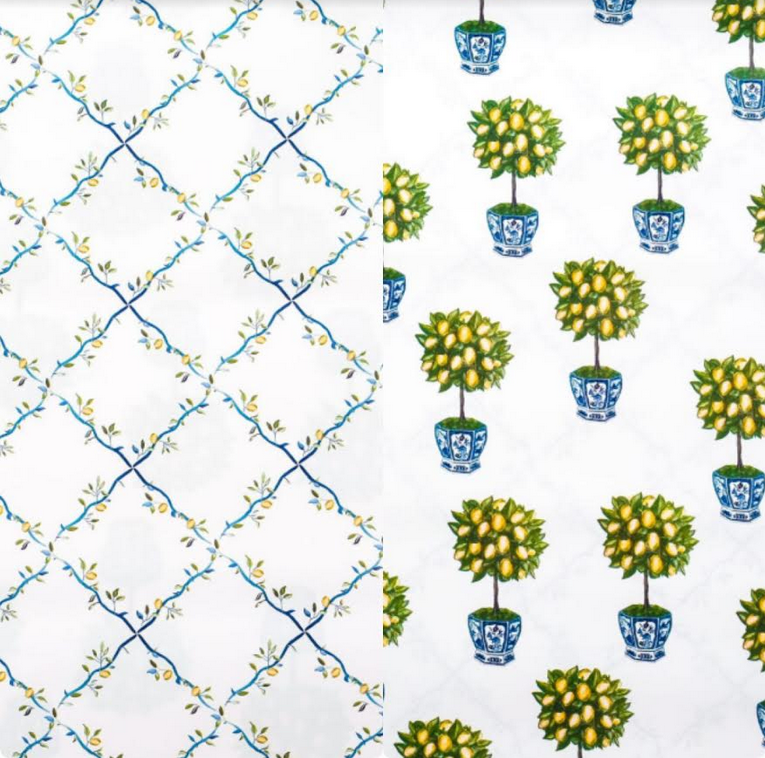 lemon topiary and trellis wrapping papers!! I absolutely am in love with the lemon topiary paper! So fresh and beautiful! I bought 2 of your beautiful monogrammed trays as wedding presents and NEED a special paper to wrap them!!! The pink and gold paper and the eggs! I love the boxwood topiary and lemon topiary, and of course, the gingham ribbon!! I love the boxwood trellis paper and of course all the bunnies. I am in blue and white heaven today. Thank you, can’t wait to wrap some presents with the paper, simply beautiful. Love the topiary giftwrap, so clever and adorable with the gingham ribbon! The gold giftwrap is my fave. The bunnies and eggs are my favorite. I’ll use mine all year long. Perfect for bringing blue and white into a baby’s nursery! Oh my! What absolutely stunning papers. Thank you for such a generous opportunity and for sharing your talent. I am sure these will sell well. My favorite is the green/gold although the pink is sooo sweet. I’ll be ordering! The ivory and pink chinoiserie papers are perfection! Classic, elegant, special. 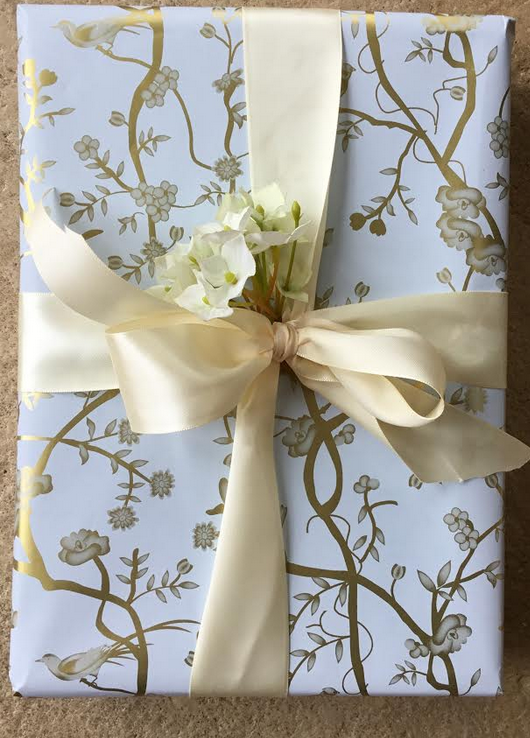 Love the lemon topiary gift wrap and the gorgeous gold and ivory Chinoiserie! I can’t help smiling. These beautiful prints remind me of a recent event in our families lives. My oldest son was married in the Month of May. And so much of our décor is reflected in the prints on these papers. Our reception was adorned with blue/white ginger jars of all sizes with wonderful hydrangeas. On the eve of the wedding, we chose to have boxwood topiaries as a point of beauty, Of course magnolia was every where so the fresh lemony smell permeating our homes with the smell of spring and newness. And as I shopped for the perfect gifts, the paper was just as important to me. 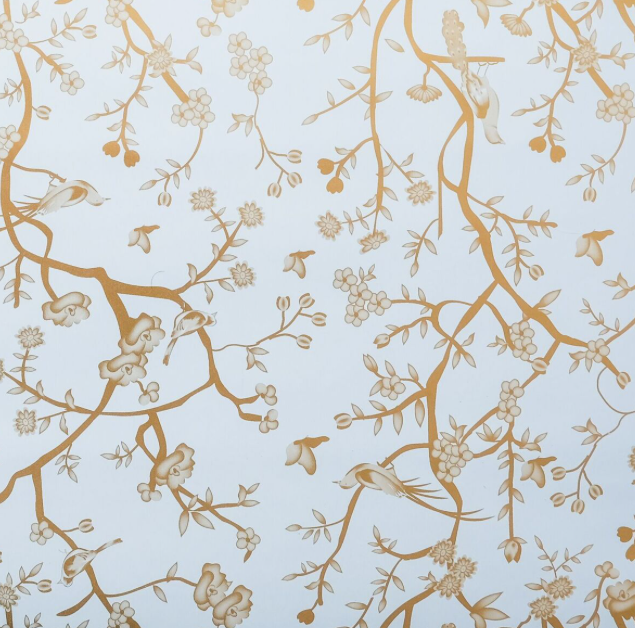 I found a paper that reminds me of the chinoiserie paper you have displayed. Our invitations were all adorned with shades of ivory and gold with our children’s initials in beautiful ornate designs. So your paper selections have made me smile and remember a happy time for family! They just say Southern Elegance in a big way. I also am a bunny girl, I have all shapes and sizes through-out my home. And much to my delight, my new daughter in law is a bunny girl too. So now I buy 2! The bunny three piece set and set of eggs! 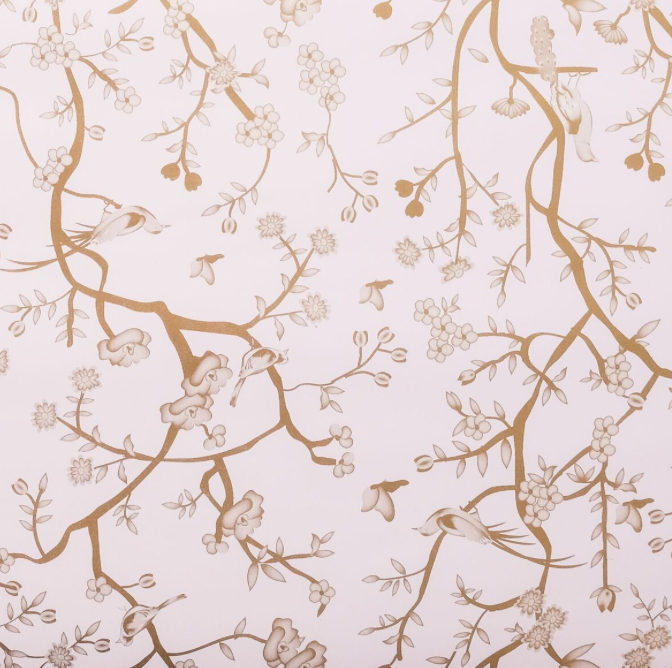 Love, love, love the white cherry blossom egg and the gold chinoiserie gift wrap! 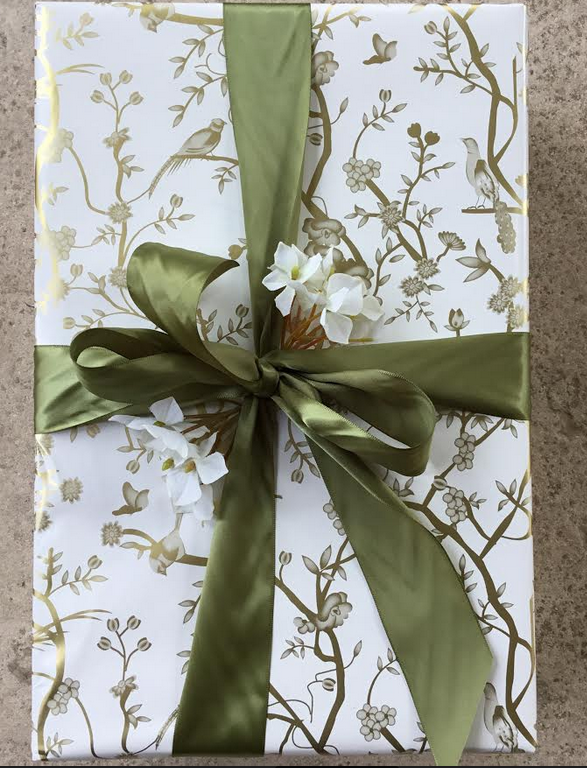 The white cherry blossom egg and the gold chinoiserie gift wrap are my favorites! 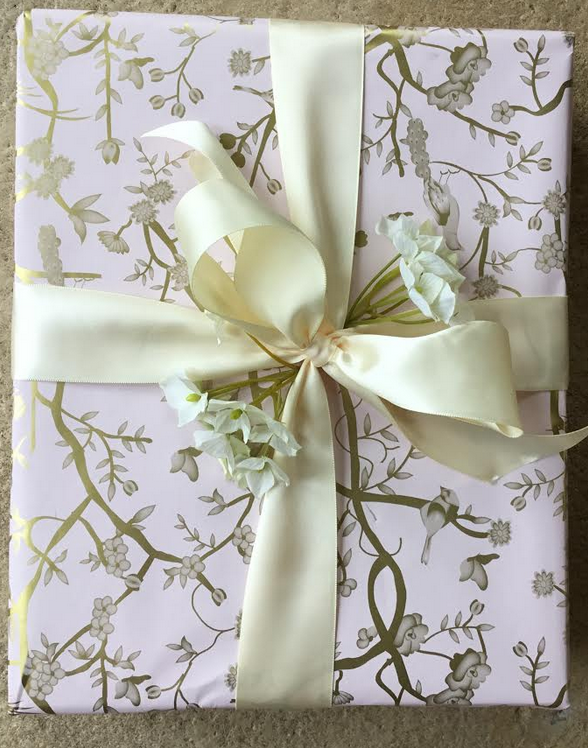 The wrapping paper is so elegant that it elevates any gift and makes the recipient feel very special indeed. 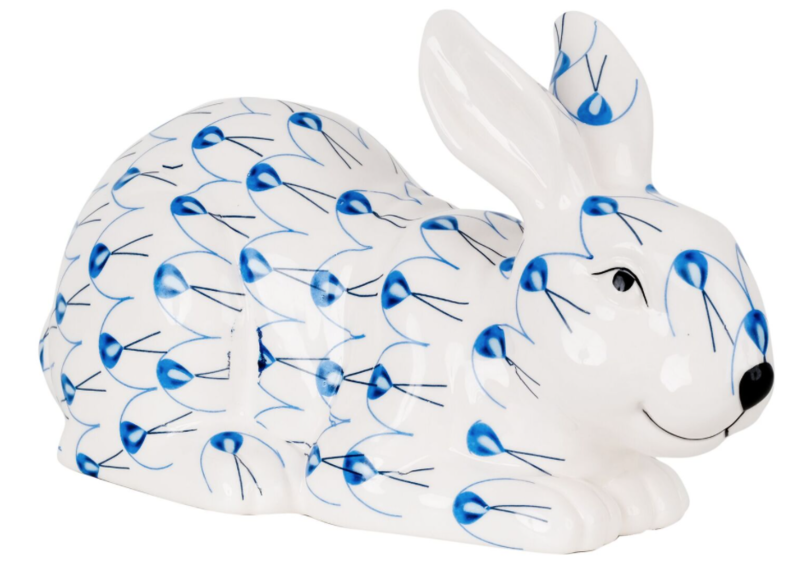 The bunnies are classic and whimsical at the same time, and would look great nestled in with all our other blue and white pieces from TEH. Beautiful gift wrap, all are lovely. Love the beautiful bunnies and the eggs! 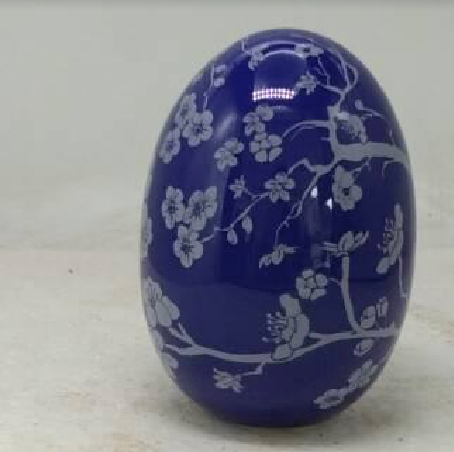 Especially love the dark blue cherry blossom egg. The boxwood planter wrap is so classic and the gingham ribbon goes so perfectly. Wonderful line. I love the ivory and gold chinoiserie paper and the boxwood topiary….simply gorgeous ! 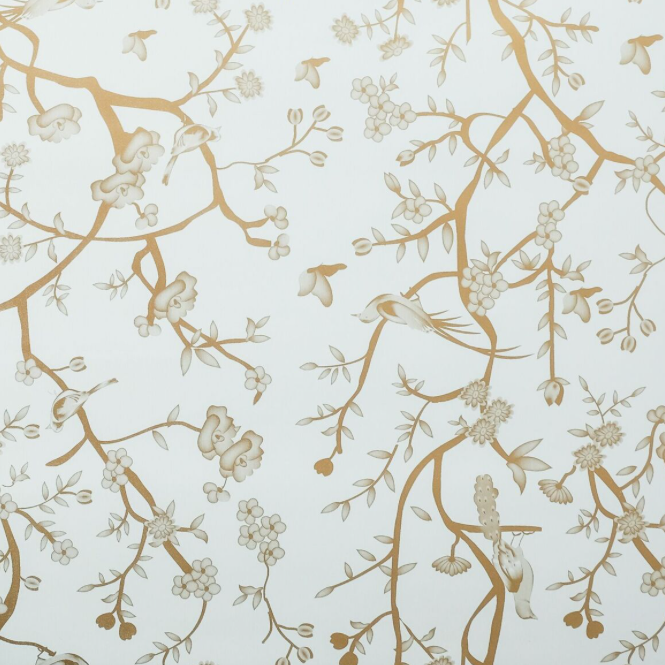 The Chinoiserie ivory paper is so classic and so lovely. It would work almost always. And the lemon topiary paper! So fresh and so unique! What a hard choice. I love all of them, but you said Pick one. The blue and white planter and boxwood. Those bunnies can hop on over any time. Again, it is so hard to choose! Everything is stellar! I love all of the wrapping paper! And also the gingham ribbon. My favorite wrap is between the boxwood and lemon topiaries. I think they are soooo charming! Thanks for having such beautiful items! Love the pale blue with gold and the lemon topiaries! Gorgeous topiary paper especially with the gingham ribbon! The lemon topiary paper with trellis and the eggs. All of the items are beautiful. The bunnies are adorable! They will be so cute at Easter time, or as you suggested, displayed all year long. But my favorite, however, is the gift wrap with the lemons. It just looks so clean and fresh. A gift would be beautiful with yellow or dark green gingham ribbon. 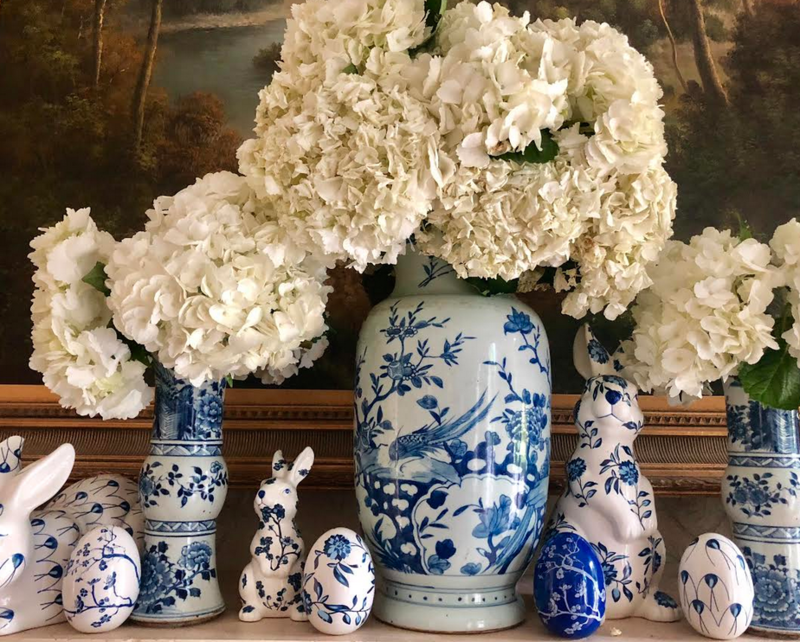 The blue and white planter and boxwood and the ivory and gold chinoiserie are my favorite gift wraps and must have items! 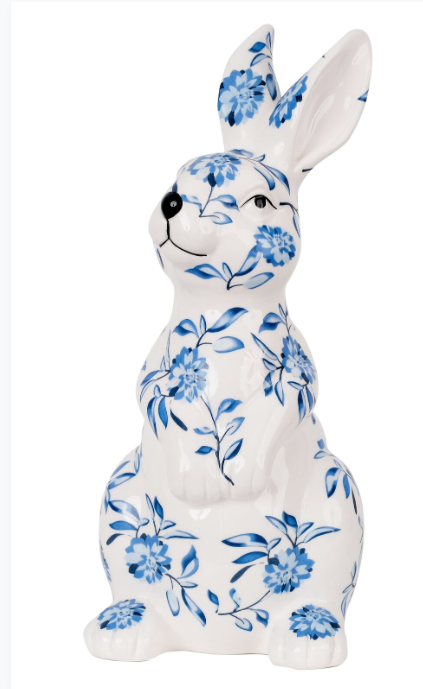 I also love all three of the blue and white bunnies and can’t wait to display them in my home! love the wrapping paper, all of it. I can just imagine the look on the faces of the people that receives gifts wrapped in it. how can anyone not love your bunny family?!! they will add a happiness to any area they grace. The pale blue and gold paper is so elegant and the bunny family is adorable! I would like one of each! Especially love the pale green chinoiserie paper with the dark green ribbon. So classic. Also I don’t think I’ve ever met a boxwood Topiary I didn’t like. 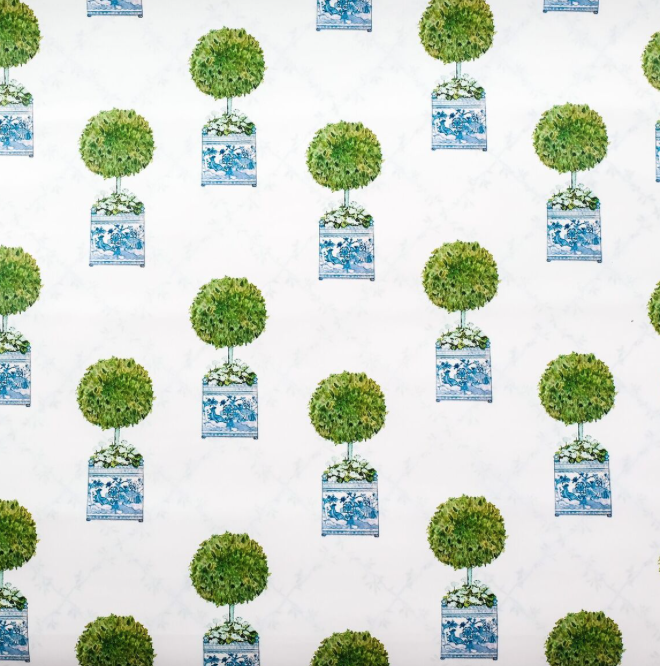 The boxwood topiary paper is perfect! I love the Papa Bunny and the Lemon topiary gift wrap! Do you sell any blue and white plates?